Published by Activision Developed by OSome Studio Platform: Xbox One Players:Solo Genre:Adventure Release date: 6th March 2015 Price: £13.99 Introduction White Night is a chilling survival horror game, set in the 1930’s in Boston. The story begins with your character travelling on a car journey when he appears to hit a woman standing in the road. Dazed and injured himself by the impact, he finds no evidence of the women he had struck. In a very isolated area of countryside all he can see in the distance is a huge mansion shining in the moonlight of the night. Staggering to the mansion and entering through the huge iron front gate, he automatically feels like the car crash was just the beginning of a terrifying night. A small graveyard in the front garden next to the mansion, give’s a mysterious clue as to the deep dark secrets that await. Upon entering the creepy mansion you realise things are only going to get worse, much worse. With the power supply being almost none existent, searching for matches is the only source of light available. You also soon find out you are not alone as a certain ghost called Margaret does not want you there. As you and your character progress and solve puzzles throughout the mansion you start to unearth the terrible goings on that have taken place. A beautiful apparition called Selena shows you flashbacks and gives you clues on how to proceed to solve what happened here. The story comes to a conclusion under the moonlight and all is revealed in a gripping storyline. Game Play - 7/10 White Night is solely built around its 1930’s Noir-era setting and brings all of its chilling suspense from the black and white design style. Narrative driven storyline in the third person leaves you trapped inside an apparently abandoned mansion. You Try to figure out the history of the former residents and the apparition of Selena who becomes your guide within the mansion. White Night gives a very fresh angle on survival horrors keeping the player in suspense about the mansion’s tainted past. The black and white graphics are perfect for how the game is intended to be played. Without matches in your inventory, its almost pitch black with only the creepy music to keep you in suspense of what may be coming next. Lighting a match becomes your very own comfort blanket making you feel safe upon entering the dining room for the first time. This is also your only source for seeking out clues and hidden paths for exploration. Exploring the 1930 style rooms with there already spooky décor with just a match is a very unsettling feeling, not knowing what you may encounter moving from room to room with no map, just being able to see what the match lets you see. If you are playing alone with a headset the atmosphere created sends chill down your spine. Of course matches do eventually go out and the game put’s emphasis on how you move, run and the match will go out a lot quicker than a slow walking pace. But with a ghost right behind you what would you pick. Matches are a massive part of the game and a certain panic sets in when you see your match going out knowing full well you only have a few left with no more in sight. Lighting a match on the move also means it will not stay lit leaving you in complete darkness, something you do not want as you hear shrieking ghosts roaming the corridors. Searching and investigating everything can trigger specific clues adding to the games story. These are in the form of the Boston Daily News articles and get recorded in your journal in the menu screen for future reference. Other clues in the shape of collectables are scattered throughout the different floors in the mansion. Fragments of former inhabitant’s diary’s uncover details of secret love affairs and other untoward happenings. Other newspapers article’s talk about a serial killer, Letters from the victims are also scattered over the mansion suggesting the murders actually took place there. Old paintings all over the walls also give clues to the developing story. The game has a similar camera style to Alan Wake using different angles depending on where you are in a certain room. This sometimes makes it very difficult to judge how close you are to a ghost in the room or if the camera suddenly changes you are then running towards the ghost rather than away. In general the ghosts are easy to outwit and can be destroyed by lights powered by the main electricity in the house. Although there is a power cut you are able to repair some fuses and repair cables to get certain lights to work in your favour, matches do not destroy the ghosts however. The repeated tasks of finding fuse’s, flipping switches, putting plugs in sockets do get a bit tedious towards the end of the game, however it does clear you a path from the dark shadows that are after you. You get used to the ghosts and become less scared of the music changing when a ghost is near, but nothing is nicer then hearing a match light up and a sense of security returning to you. 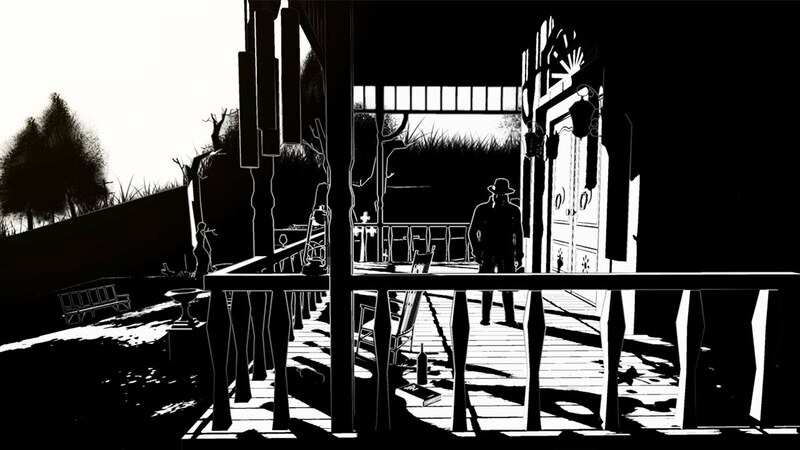 Graphics – 9/10 The graphics to White Night are very unique as it is all done in black and white, which adds tremendously to the intense atmosphere the game creates. Lighting a match lets you see a small area in front of you just letting you see enough of what is ahead. The smoothness of the camera and entering different areas could not be more fluent making it very easy on the eye. Overall the style in which the game is made the graphics cannot be faulted as it does everything the developers wanted. New French developer OSome Studios have done a fantastic job in delivering a top line survival horror game. Sound – 9/10 The sound quality and the narrative voiceover on White Night is truly a pleasure to hear, adding to the already atmospheric gameplay. Every part or the in game sounds are as real as you can get, the rumbling of thunder and flashes of lightning feel as if there really was a storm outside. The striking of a match you hear so often throughout the game again almost as if you were lighting it in your own hand. Ghosts that lurk in rooms and hallways resonate a sound that really makes you think 'what the hell is that', the footsteps on the wooden floorboards and the whispering voices you hear. All these put together and the darkness of the game really enhance the game to another level, adding to the suspense and anxiety the game creates. Difficulty – 4/10 The game itself is not too hard at all and needs no skill to play. The main storyline and the puzzles you need to solve are what progresses you through. There are over 100 collectable’s in the game which also unearth the clues you need to find certain items. Some of the puzzles are tricky with no guide, however as I have mentioned the clues are in the collectables. As for enemies there is only one type and they are ghosts. With trial and error of predicting the ghost’s walk pattern, you can either use a well-timed run or interact with lamps to actually make the ghost disappear. If you are a completionist some of the collectibles are well hidden and the game has a few points of no return, meaning multiple playthroughs are needed as there are no chapter select options. There are also aspects of the game linked to the moon’s real life cycle and an alternate ending can only be obtained on a full moon in actual real time. Like I said overall not too hard but if you are an achievement hunter, a well-planned out strategy may be needed to completed the game in minimal playthroughs. Finally some electricity in the place.. Achievements – 8/10 White Night has a total of 33 achievements with a nice mix of collectables versus normal gameplay, with a few more tricky ones mixed in. One very interesting aspect of White Night is a few achievements are actually linked to the real lunar cycle, and to get the achievements the game has to be played on a actual real life full moon, cool uh. A clever feature on the title screen is it will actually have the moon and what part of the cycle it is on whether it be half moon, or crescent. It is also clearly visible in game when you are outside or even inside when looking out of a window. This is also part of a alternative secret ending and part of a gripping storyline. A main chunk of achievements are for the collectables, with over 100 to find. These range from fragmented diary pages from the inhabitants of the mansion, 60 newspaper articles, 10 letters from the murder victims and various letters from the ghosts haunting the mansion. All the collectables make up the missing pieces within the story, some can be tricky to locate but exploring the mansion is key and the collectables should come through natural progression. All in all the list is very cleverly set out, and with the moon element is a refreshing take on achievements. Good planning and consistent searching all achievements can be obtained in one play through, just be aware there are points of no return which will lead to another playthrough being needed. Summary I played White Night for 13 hours and 2mins, in that time I completed the game and achieved the full 1000G gamerscore. White Night definitely exceeded my expectations leaving me wanting more if I’m honest. Anybody who likes survival horror will definitely enjoy the intense atmosphere the game give's off, right from the start. The game becomes slightly repetitive as there are only so many times you can turn a light on and off, or find a fuse and return it to the fuse box. However the dodging of the ghostly figures in between rooms is more then enough to overcome that. The only other downside to the game is the camera style, running down a hallway past a ghost and the camera switches making run back towards the ghost. It did get slightly annoying but again you get used to it not long into the game. An exciting new style of survival horror with a few great unusual achievements did not disappoint.